Hampden Park, Glasgow - site of the 2014 Commonwealth Games athletics. his season's best, and he finished in 12th place. This little motorised van ferried the discus back to the throwers. I wonder how much Richard Branson paid to sponsor it. at the London2012 long jump qualifying event. pulled up injured during the run-up to her first attempt. Christabel Nettey of Canada took the bronze medal in the Women's long jump event. conditions endured by the athletes (and officials). Marlyne Ngo Ngoa making a splash. We were treated to the Women's 1500 (T54) event, which was won by Australian Angie Ballard. Meggan Dawson-Farrell (rear) and Samatha Kinghorn (front). 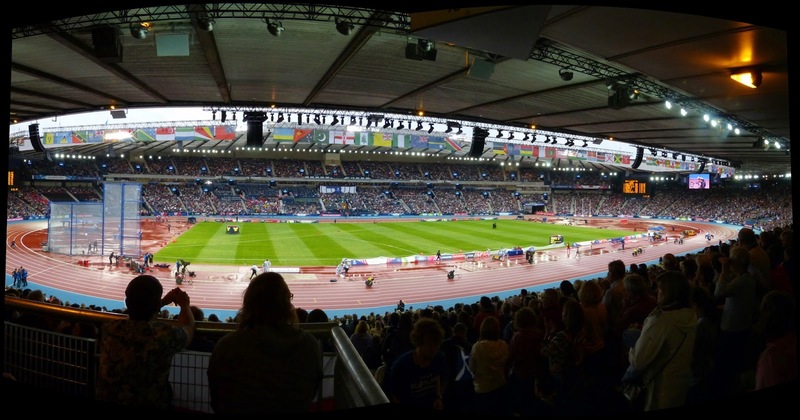 Panorama of Hampden Park - 2014 Commonwealth Games. gold from a clearly still some way from full fitness David Rudisha. although all of the medal winners are out of shot. clattering into the third hurdle from the finish in the 400m Hurdles Final. He had been in the silver medal position at the time. Conclusion of the Women's 400m hurdles final. disappointing to see flags drooping at a medal ceremony? machine would enhance the spectacle immeasurably. ...won with consummate ease by one of the stars of the games Blessing Okagbare of Nigeria. The girls negotiate a forest of obstacles in the first heat of the 100m Hurdles event. by two metres bringing the action so much closer to the fans. Pity about the rain, though.